As my two years at the Museum of the City (MCNY) comes to an end, I would like to take this time to reflect on one of the most valuable experience I’ve had so far in my career in museum education. As part of my fellowship, one of my special projects was to integrate Science, Technology, Engineering and Math (STEM) initiatives into educational programs and field trips in conjunction with the Museum’s exhibitions. This blog post will focus on my work with the Future City Lab (FCL) field trip and the results from that project. The F.A.O Schwarz Education Center offers interactive, inquiry-based field trips in the Museum’s exhibitions and classroom spaces. My fellowship at MCNY began in 2017, shortly after New York at Its Core opened in 2016. New York at Its Core is a three-gallery exhibition that traces the history of New York City. Two of the three exhibition spaces look at New York City from historical perspective, with the third dedicated to looking ahead to New York’s future. The focus of my fellowship was developing the field trip in the Future City Lab, an interactive space where students experiment and share their future visions of New York. The Future City Lab addresses five central challenges including housing, the environment, transportation, living together as New Yorkers and making a living in the city. 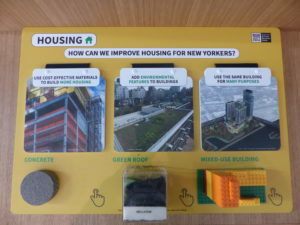 The exhibition is designed into three organized experiences: the mapping table, the “what-if” table and an interactive game section, which allows visitors to create apartment buildings, waterfront parks, and city streets of the future. 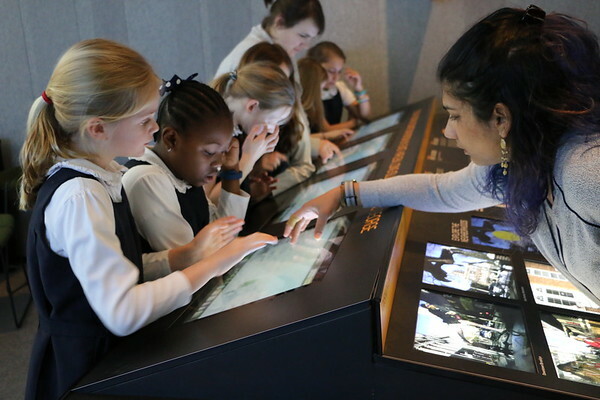 When the exhibition first opened, our field trip used the mapping table as a teaching tool. The mapping table is a one of a kind feature, which visually represents information about the five central challenges. Educators found that young students had a difficult time grasping the information on the mapping table, oftentimes struggling to understand the visualization of the data on the maps. 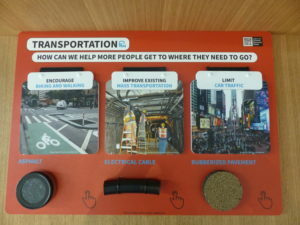 In an effort to make the program more interactive, educators used the “what-if” table, that asks visitors to form questions about the changes they want to see in the future of NYC and to respond to each other’s questions. Educators found that having young students write “What If” questions about New York’s posed challenges to students struggling with writing. In May-June of 2017, the museum hired an outside firm, Randi Korn & Associates, to officially evaluate and give feedback on the NYAIC galleries field trips. The evaluation confirmed that young students struggled to understand the data presented to them in the ways described. This was important to know because the majority of participants attending this field trip were elementary school groups. Another area identified for growth was the suggestion to spend time at the beginning of the program preparing students for the choices they could make in the games. Having this kind of scaffolding at the beginning of the program would allow students to better understand the impact of their choices in the games and how these ideas can be applied to their own living environments. The Education Center educators decided to use this feedback to create a new opening activity for the Future City Lab with the help of a content developer. My goal was to provide common ground for students of all ages to understand these larger concepts, participate in a discussion with their peers around the issues, and ultimately design their own urban spaces in the future. We wanted to ensure that this activity was accessible for everyone and would appeal to students with different learning styles. A highlight for me when seeing students use the boards on their field trips, was their excitement to touch the materials and assume the role of an urban planner. Our educators would introduce the space as a lab for students to experiment and try out their ideas. When using the boards, students were asked to pick one of the three solutions that they thought could best solve the problems listed above. As students debated the pros and cons of each solution on the boards, they would quickly realize that no one solution is perfect and that they must consider the trades-offs that go along with whichever solution they select. 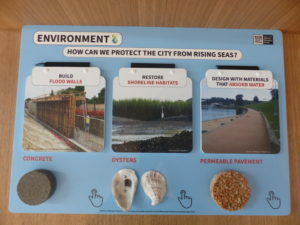 After sharing their thought-process for arriving at that solution they were interested to learn that the city actually uses all three of their solutions to solve the problem, and that urban planners, like them, have to grapple with the tradeoffs (such as environmental benefits and cost) they identified. It was exciting to see students draw from these discussions to apply to the games. For this reason, I purposefully selected materials that were present in the games, and on many occasions, students have asked their educators where these materials were located in the games. Since the introduction of the boards to the field trip, we have found that students are now more likely to approach the games with intention and to better understand their choices and the real-life initiatives the city is taking to resolve its current challenges. Not only were students thinking more critically about the impact of their choices, but they also contributed more in the concluding discussions about what they want to see in the future of NYC. I think another success was having teachers say that they see their students being able to take what they’ve learned in the gallery and applying it in real life. One of the goals of the gallery experience was not only for students to have fun, but also to enable them with the tools to think about their own impact on their everyday life and the ways they can make a difference. I needed was already there but the process of making an activity that was both content-rich and student friendly was invaluable. As a professional, I learned the importance of collaboration and how to help new educators feel comfortable using the activity with students. I also learned how to draw from feedback to think about ways that we improve the accessibility for students. This has been an incredible two years for me and a wonderful learning experience. I want to thank FAO Schwarz Foundation for this opportunity because this experience would not have been possible without this fellowship position. 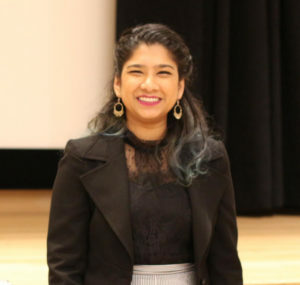 Jai Manni is the FAO Schwarz Fellow at the Museum of the City of New York.